Any time of year is the time we should think about peace and this t-shirt is covered with peace signs. 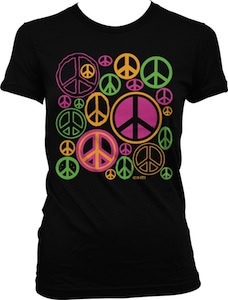 The t-shirt is black and has a bunch of neon peace signs in all kind of sizes and shapes. This t-shirt is a women’s junior fit and comes in a wide range of sizes. Come and check out this Neon Peace Signs T-Shirt.